Abu Dhabi is a city in the UAE. Abu Dhabi is the capital and the second largest city in the United Arab Emirates (UAE). It is also the largest emirate of the seven emirates that make up the UAE. The city is located on a T-shaped island in the Persian Gulf off the central western coast. In 2013, the city had an approximate population of 921,000. 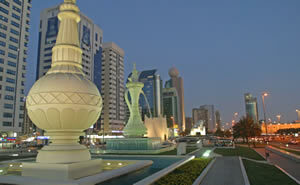 As the capital, Abu Dhabi is the seat for the United Arab Emirates Government, housing various offices of the federal government. It is also the home of the Abu Dhabi Emiri Family and the President of the UAE from this family. Along with Dubai, Abu Dhabi makes up the country’s two centers of commercial and cultural activities. In 1962, Abu Dhabi became the first of the emirates to begin exporting oil. Hence, effectively transforming the city’s, as well as UAE's, society and economy. Today, Abu Dhabi has grown to be a cosmopolitan metropolis and is home to the Abu Dhabi Securities Exchange, the Central Bank of the United Arab Emirates and the corporate headquarters of many companies and numerous multinational corporations.